A Magic Shrink Potion is a yellow concoction that is capable of shrinking almost anything it touches down to a minuscule size. In order to work, its target must be doused in it, as a few mere drops are not enough to have any effect. It is unknown if the effects of the potion are permanent, although they can be countered with an antidote such as the Magic Growing Potion. Waldo the Wizard is apparently the inventor of Magic Shrink Potion, as he is capable of conjuring up a flask with little effort. The Magic Shrink Potion makes its first and only appearance in The Super Mario Bros. Super Show! episode "Princess, I Shrunk the Mario Brothers". When Mario, Luigi, Princess Toadstool, and Toad are sentenced to the dungeon of Waldo's castle by Mouser and two Koopa Troopas, Waldo reveals himself and douses the villains with his Magic Shrink Potion. Once they shrink, Waldo places them in a fishbowl and announces that he will use his potion to vanquish King Koopa once and for all. 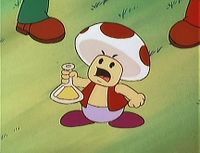 Hoping to shrink King Koopa himself, Toad takes the Magic Shrink Potion from Waldo and runs out of the dungeon with it. While attempting to splash King Koopa with the potion, Toad accidentally hits Mario and Luigi with it, shrinking them instead. Although Mario and Luigi get into several misadventures while they are small, they are eventually restored to their normal sizes when King Koopa mistakenly sprays them with Waldo's Growing Potion. A bottle of shrinking potion also appears in the Nintendo Adventure Book Unjust Desserts, provided by Doc Drake. Although never referred to as such, Princess Peach can sometimes create a type of shrink potion in Paper Mario: The Thousand-Year Door if she fails to properly produce an invisibility potion in the X-Naut Fortress laboratory. The effect of this potion is only temporary, and it serves no real purpose. This page was last edited on February 18, 2018, at 00:59.